“Hope” is the thing with feathers in Emily Dickinson’s poem. 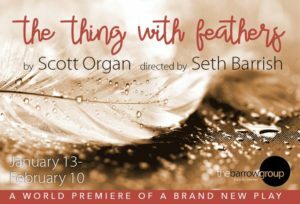 It “perches in the soul.” It “sings the tune without words.” It is the little Bird that “kept so many warm.” But in Scott Organ’s new play the thing with feathers, now making its premiere with the The Barrow Group Theatre Company, the characters have little hope, with feathers or without. In fact, a much better title for the play might be “the sins of the father,” which the Bible tells us shall be visited upon the sons to the third and fourth generation. As the thing with feathers unfolds as something of a mystery, suffice it to say that the drama illustrates how the past has a way of coming back to haunt us. 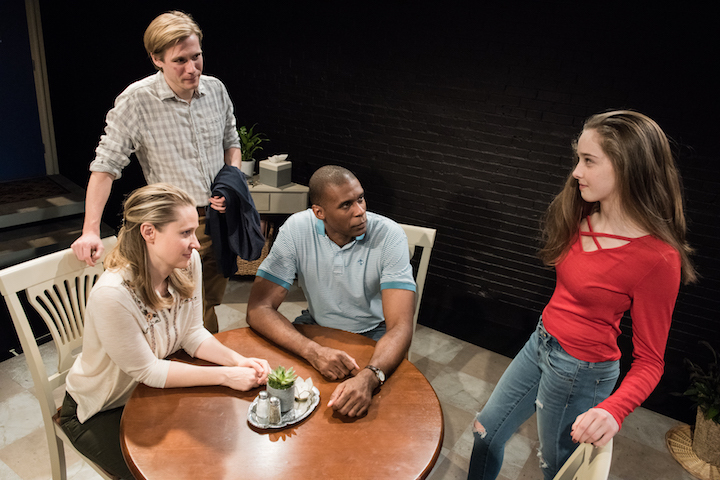 The play, tightly directed by Seth Barrish, evolves Beth (DeAnna Lenhart), a single mother; her teenage daughter, Anna (Alexa Shae Niziak); Beth’s boyfriend, Tim (Robert Manning, Jr.); and Eric (Zachary Booth), the 28-year-old man Anna meets on the Internet and eventually falls for. These actors’ ensemble work makes the drama riveting. The two-level set, which reveals the kitchen and Anna’s upstairs bedroom, sets the stage for some very ordinary events (making dinner, celebrating Anna’s 17th birthday), as well as life-altering experiences (the deflowering of Anna and her estrangement from her mother). 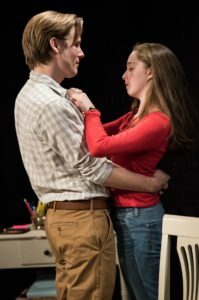 Through the first half of the play, Beth seems very much a typical mother dealing with a daughter on the brink of adulthood in the Age of Technology. Lenhart exudes the ordinariness of a hassled parent trying to keep her life on track with the help of Tim (a rock-solid Manning). The only hint of trouble is her confession that she’s far from perfect and her divorce was not entirely the fault of Anna’s father. Anna appears at first as a bright, thoughtful and careful young girl. Up in her bedroom she talks online about poetry with Eric. Niziak gives her all the flippancy and neediness that so often go hand-in-hand in young people. Then Eric appears in the flesh, and Anna throws caution out the window. This change seems a bit abrupt and may be difficult for some adults to understand, unless they take time to remember their past selves. Fortunately, Booth is charming, quirky, petulant and just plain fascinating enough to make us understand what women (especially susceptible women) might see in him. If the thing with feathers is mostly an ensemble piece, it also gives Booth the chance to show his versatility, keeping the audience perpetually wondering what he will do next and why he will do it. But Eric is merely a catalyst. What’s really at stake is Beth and Anna’s relationship and their future. The answer to this lies in another poem by the formidable Ms. Dickinson, who wrote: Our common sorrow, like a mighty wave, Swept all my pride away, and trembling I forgave!